Length: Adults can be slightly more than 50 mm (3 inches) long. Color: Adult American cockroaches are reddish brown or mahogany colored. The area behind their heads is outlined with a yellow band. Female American cockroaches make protective cases for their eggs. These cases are capsule-shaped. After forming a capsule, the roach deposits it in a warm, humid area. An average American roach egg capsule contains about 16 eggs. When the eggs hatch, the tiny nymphs come out of the capsule. As they grow, the baby cockroaches shed their skins. If there is plenty of food, American cockroaches can develop from egg to adult in as little as 5½ months. Both male and female American cockroaches can fly. The wings develop when the roaches become adults. American cockroaches normally live outdoors. They prefer warm, damp areas like flowerbeds, and under mulch. In many parts of the United States people call them “palmetto bugs” because they live on trees. American cockroaches are very common in sewer systems of many American cities. American cockroaches enter homes to find water or food. They can easily pass under doors if the weather stripping is damaged. Basement windows and garages are also common entryways. When American cockroaches enter homes, they often go to bathrooms, kitchens, laundry rooms and basements. Outdoors, American cockroaches eat leaves, tiny wood particles, fungi and algae. They also eat small insects. Indoors, American cockroaches forage under appliances, in drains, in kitchen cabinets and on the floor. They eat crumbs, scraps of food and spilled food that they find. They will also eat pet food that is left out overnight. American cockroaches leave their droppings in the dark areas where they hide. Homeowners may find these droppings in basements, in pantries or behind appliances. American cockroach droppings are small, and sometimes people mistake them for mouse droppings. American cockroach droppings have ridges on the sides and they are blunt on the ends. Mouse droppings have pointed ends. Since mice groom themselves, mouse droppings often have hairs embedded in them. American cockroach egg cases are about 38 mm long. They are dark-colored—reddish or blackish brown. Homeowners often find these egg cases in basements, in laundry rooms or kitchens. The egg cases may be under cabinets or behind appliances. American cockroaches also deposit their egg capsules behind stored items in garages and sheds. 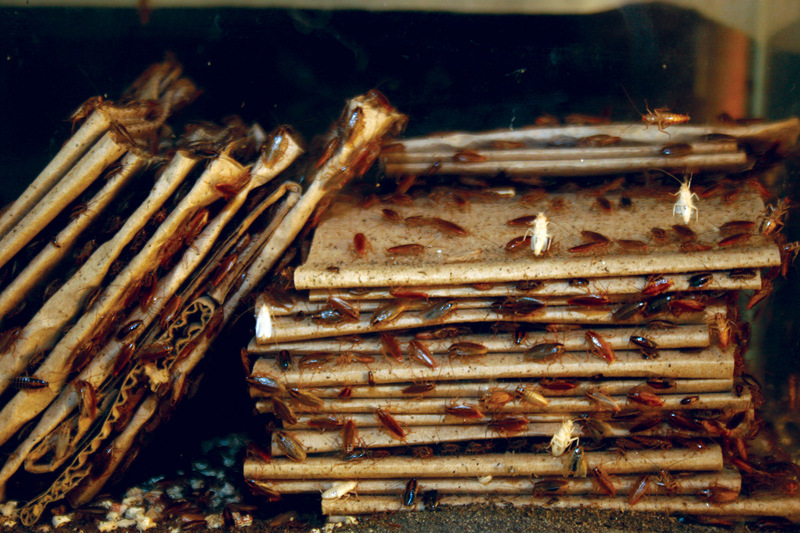 Cockroaches produce a chemical called an “aggregation pheromone.” The odor of this chemical causes the roaches to stay together in groups. Some people describe the odor of these pheromones as having a “musty” smell. As the roach population starts to grow, people with sensitive noses may begin to notice this odor. How Did I Get American Cockroaches? American cockroaches enter home to find water or food. They can easily pass under doors if the weather stripping is damaged. Basement windows and garages are also common entryways. When American cockroaches enter homes, they often go to bathrooms, kitchens, laundry rooms and basements. How Serious are American Cockroaches? Cockroaches are filthy pests. They can spread disease, contaminate our food and cause allergies and even asthma. Cockroaches can pick up germs on their legs and bodies as they crawl through decaying matter or sewage and then transfer these germs to food or onto food surfaces. According to the World Health Organization (WHO), they are proven or suspected carriers of the organisms causing diarrhea, dysentery, cholera, leprosy, plague, typhoid fever and viral diseases such as poliomyelitis. 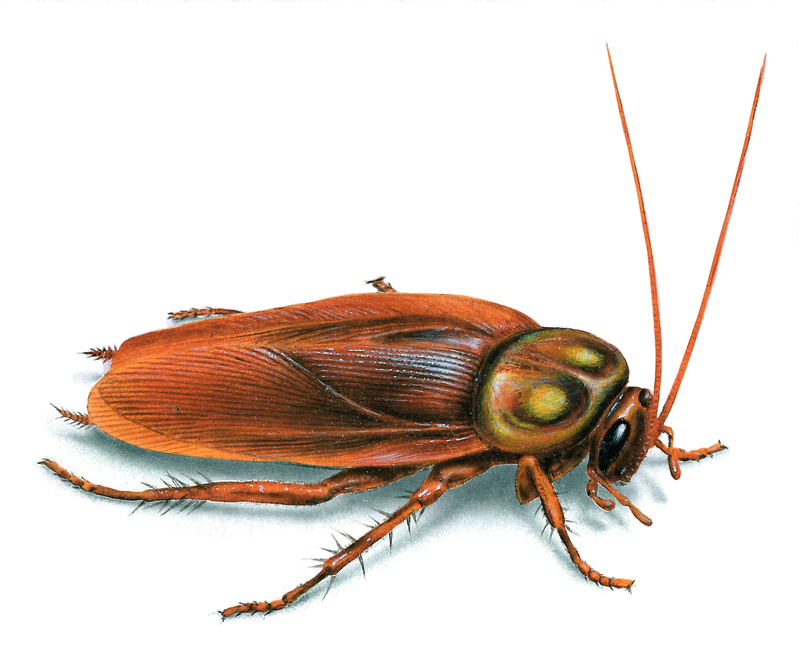 Orkin encourages people to help reduce cockroach populations by removing all food and unnecessary water sources, sealing all cracks and crevices, vacuuming and removing shelter sites like cardboard and paper. To effectively manage a serious cockroach infestation, you must correctly identify the type of cockroach causing the infestation, which is why it is important to contact a pest control professional. The Orkin Man™ is trained to help manage American cockroaches. Since every home is different, the Orkin technician will design a unique program for your situation. Keeping American cockroaches out of your home is an ongoing process, not a one-time treatment. Orkin’s exclusive A.I.M. solution is a continuing cycle of three critical steps—Assess, Implement and Monitor. The Orkin Man™ can provide the right solution to help keep American cockroaches in their place … out of your home. Locate areas of American cockroach activity. Identify the causes of the American cockroach problem. Look for entryways that American cockroaches could be using to get into your home. Exclusion–Nonchemical methods such as caulking or door sweeps help keep American cockroaches from entering your home. Landscape modification—If American roaches are living around your home, it may be necessary to remove dead leaves or rake mulch away from the foundation. The technician will point out these opportunities. Gel or granular bait—These are applied in areas where American cockroaches will eat them but children or pets cannot reach them. Insect growth regulator—Applied into cockroach hiding places, these interfere with the cockroaches’ normal development. Residual insecticides—Applied into cracks and crevices, these help keep American cockroaches from hiding in the treated areas. The technician may also apply liquid insecticide outdoors to help keep American cockroaches from coming inside. Confirm that previous treatment was effective. Check for new American cockroach activity. Identify changes to the home or landscape that could make your home vulnerable to American cockroach invasion. The Orkin Man™ can provide the right solution to keep American cockroaches in their place … out of your home. For more information or to schedule an inspection, please contact your local Orkin branch office. The Orkin Man™ can work around your schedule. In many cases, treatments will be made on the outside—sometimes with no need for you to be at home. Keeping American cockroaches out of your home is an on-going collaborative process, not a one-time event. Orkin’s A.I.M. solution is the ideal way to help keep these pests where they belong—outside your home. While it might seem easy to quote a service price online, in fact it really is almost impossible. Since every home is unique, no two treatment plans should be exactly the same. The best way to prescribe an effective treatment plan and to quote an accurate price is by having a trained professional complete a comprehensive inspection. The American cockroach is also commonly known as the water bug, flying water bug or palmetto bug. These large cockroaches can grow to exceed 50 cm in length. Although the American cockroach is a major pest in the United States, they are native to the tropical climates of Africa. Some evidence has suggested that the American cockroach was brought to North America aboard ships. They are a peridomestic species and live primarily outdoors. In southern states, they are common in shady, humid areas like flowerbeds and around trees. In northern areas, they are usually found in sewers and drains. Climate changes or food shortage can cause them to move indoors. When they move indoors, American cockroaches prefer to live in moist, humid environments. They can also survive in dry areas with sufficient food and water sources. These insects favor temperatures between 70 and 80 degrees Fahrenheit. When an American cockroach population infests a human home, the insects are drawn to food storage and preparation areas, as well as moist locations. In industrial settings such as restaurants and bakeries, they can be found in boiler rooms and steam tunnels. 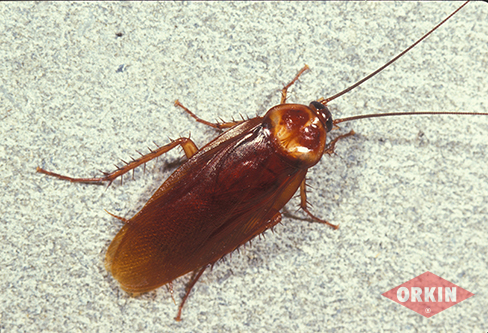 In residential and commercial buildings, the American cockroach typically infests basements and landscaping. American cockroaches are moderate flyers. They also gather together in open spaces, while other domestic cockroaches tend to hide in cracks and crevices. They do enjoy sweet foods, but prefer decaying material. Does the American Cockroach Fly?